Home » The SHIFT Kicker » 30-Days of Silence Day 30! This is the last day of my 30-Day commitment. I can’t believe how fast the time went! Last night I did a reading and asked a couple of detailed questions about these readings, and my life work that I’ve been doing over the last 20+ years. The answers I got blew my mind! I’ve contemplated my process here and there, but hadn’t explored it (evidently deeply enough). With a much deeper understanding about what I’m actually doing in my sessions, I went into a client session today with a very different mindset. And as a result, the she had a HUGE breakthrough on something that’s been plaguing her for most of her life. WOW!!!! I want to work with this deeper understanding for a while before I share it. But, I’m extremely excited about it! Right now I’m feeling very quiet, in fact, I won’t be engaging in much extracurricular activity between now and the 27th. I want to keep this energy going and stay very focused. This has been a very worthwhile pursuit to consciously cut communication as much as humanly possible (while still working and being an active parent) for 30-Days. It and my focused practices have allowed me discover a deeper, stronger, and more connected person than I previously knew myself to be. And I am very, very grateful for it. I look forward to sharing the (what’s the opposite of fallout?) fallup/positive outcome/blessings as they appear. 1) You are someone who cares about me and what I’m doing. 2) My work, philosophy, or how I approach the healing process appeals to you. 3) Something about my journey has called to you to go deeper yourself in your own way. Whatever your reason, I bow to you and wish you a blessed journey of your own — whether it’s bravely going more deeply into your purpose, and then going out into the world and offering that, or it’s openly discovering what your true purpose is…why you’re here…and what gifts you have to offer. It’s all an extraordinary journey, and I wish you Godspeed. I’ll soon be adding a new page to this site describing the readings I will now be offering. So check back in! P.S. 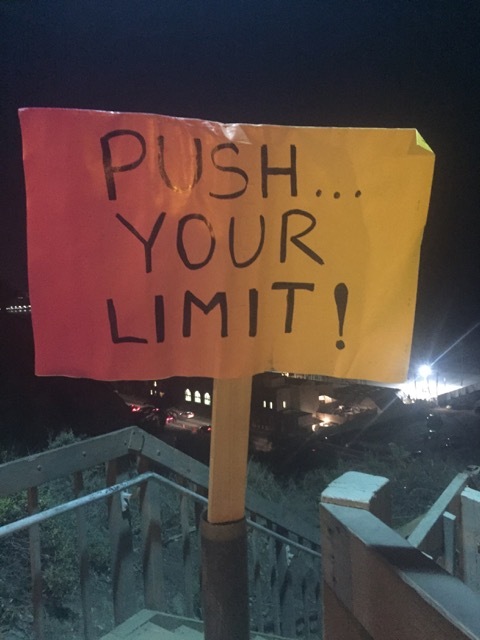 After writing this post, I went out for my power walk and was contemplating what all transpired over the last 30 days, and what’s ahead of me. 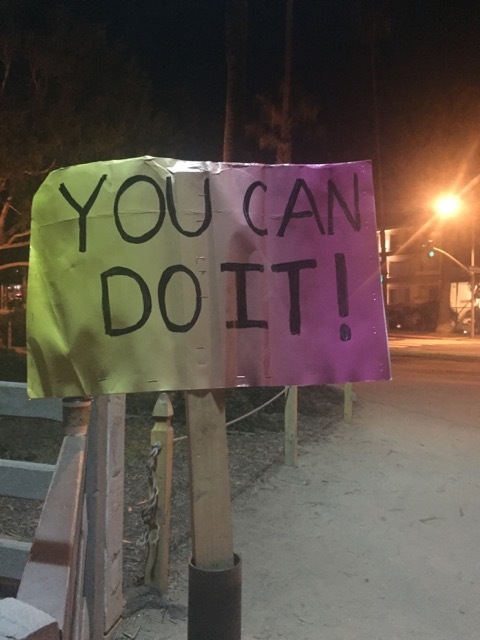 As I was walking back up from the beach I saw this sign that I’m assuming was left over from the Marathon. 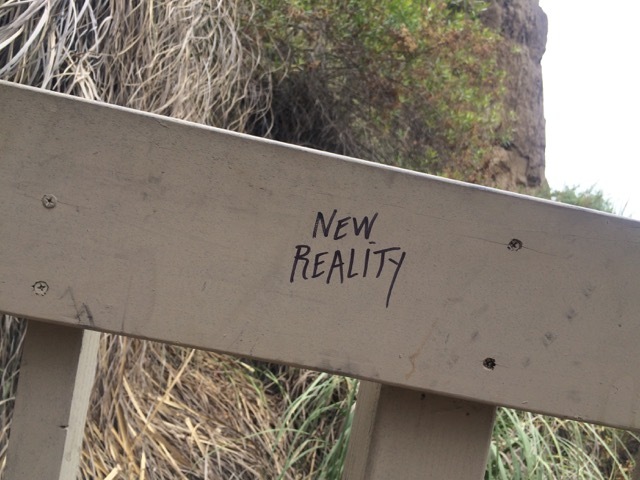 (Interesting that it wasn’t there on my way down.) Anyway, what a great message and perfect way to end my 30-Days of Silence posts!!!! !